Ephemeral messaging is the buzz word right now thanks to the smash hit Snapchat. Frankly messenger is the new entrant in this new lucrative messenger app space. Though a recent entrant, Frankly has managed to lure a decent number of users in a very short time. While Snapchat prioritizes photo messaging, Frankly places importance on text messaging. So, lets see what unique features Frankly messenger has to offer. Frankly messenger has a clean, simple and very easy to use interface. It sports three screens namely contacts, chats and settings. Frankly uses email and phone numbers to connect people. You can send friend requests to your friends using their phone number or email id. Frankly has also recently added a new feature with which you can add friends. Frankly has assigned a unique PIN to all its users (similar to Blackberry Messenger PIN) which can shared with your friends. Your PIN can be found under your profile picture in ‘Settings’. When you know your friend’s PIN, you can add him by going to Contacts -> Add by PIN -> Enter your friend’s PIN. Frankly also lets you to link multiple email ids to your account. All you need to do for this is to verify your email ids. This is a particularly useful feature of Frankly wherein your friends can find you using any of your email id. Tap on ‘Chats’ at the bottom of the screen to start a private or group chat. If you are new to Frankly messenger you can practice chatting with Veronica. 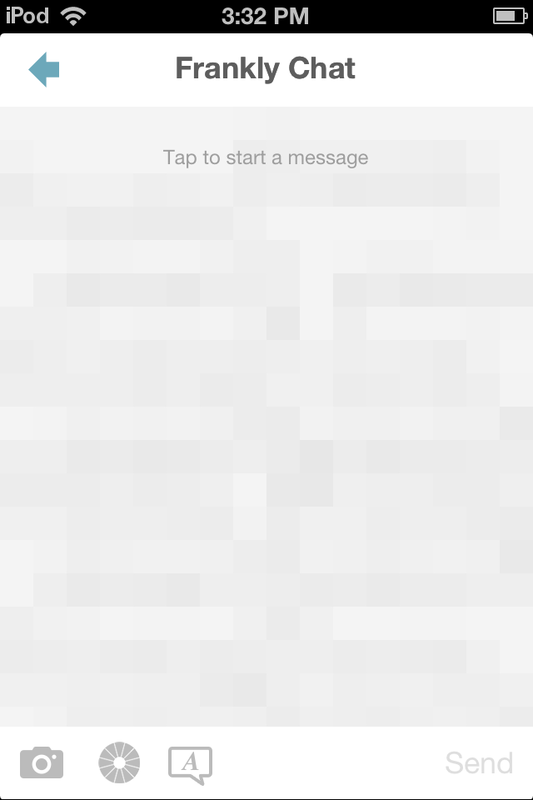 To start messaging, tap on the chat screen. To change background color and text size, tap on the wheel like icon at the bottom of the screen. Pinch to change text size and drag along the screen to change background color. You can also send photo messages on Frankly by tapping on the camera icon at the bottom left corner of the chat screen. You can either take a new photo or send an existing photo from your camera roll. It some times happens that we send messages in haste and regret it the moment we hit the send button. 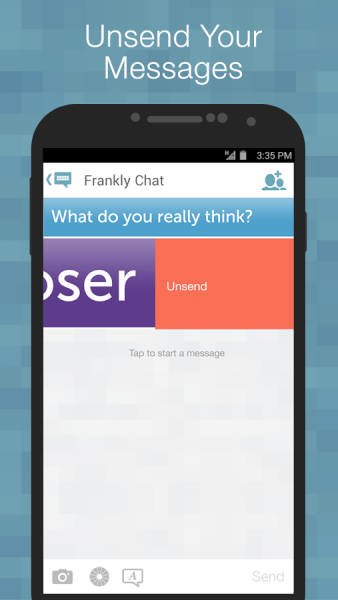 With Frankly you can avoid these awkward situations by using the unsend feature. Any unread message can be deleted by swiping on the message from right to left and tapping on ‘unsend’. If you feel like having a chat with multiple friends at once, you can choose group chat on Frankly. You can select two or more friends to have group chat. Group chat has a funny feature called anonymous chat which shows you only the messages and not their senders. You can set ‘Anonymous Chat’ to ON to use this. The messages you receive on Frankly are garbled and you can tap on them to reveal the message. Viewed messages are destroyed after ten seconds. Every message sent on Frankly automatically self destructs in twenty four hours even if it’s not opened. 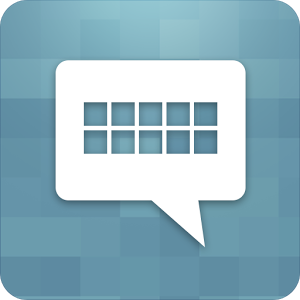 Overall, Frankly is a great ephemeral messaging app for sending texts. It lets you express yourself by personalizing your messages. You can shout or whisper your messages by changing the text size. Similarly, you can also express your mood by changing the background color (say for example, red signifies anger). Frankly does its job best if texting is your main priority. It completely ignores video messaging and does a mediocre job at photo messaging. So, have you used Frankly yet and what do you think about it?